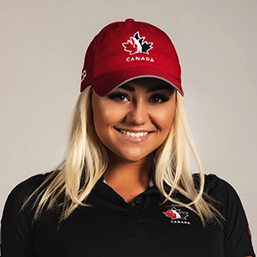 Joining Team Canada for her rookie campaign is Brigitte Thibault of Rosemère, Que. 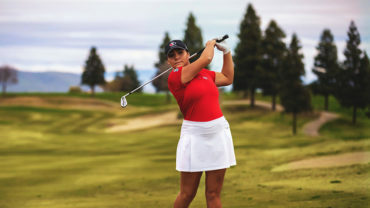 Thibault enters her first year with the national squad after collecting three top-10 finishes as a member of the Fresno State Bulldogs, including a runner-up finish at the UNLV Collegiate Showdown. She added top-10 results at the Women’s Western, North & South and Quebec Amateur. She finished runner-up at the Quebec Junior Girls in 2017. People usually call me B or Bri. I don’t really know, it was sudden. My parents were into golf for 30 years and I used to hate it. In cheerleading, I was having a lot of injuries and somehow switched to golf. Two older sisters: Julie who is 21 years of age and Laurence who is 24. I would want maybe Cameron Diaz just because all my life, many referred my sisters and I to her. I am a really shy and a sensitive person on the inside. I consider see myself as a nerd who works really hard for what she wants. I trick someone’s brain thinking I know what they’re going to tell me because my brain can recap someone’s lips and sound faster than they say it, so I am able to say it at the same time as that person. A cute baby mix wolf/husky that I ran into with blue eyes. The city and the summer. Karma is one I truly believe in. If you don’t treat life right or honestly, it will catch up to you. Also, that everything happens for a reason, so trust the way that is meant for you. How heavy my clubs are and this lucky master marker I carry around.